I wish to thank you, our great leader and Director of Radio Biafra/Biafra TV for your resolute and formidability towards the restoration of our dear nation, Biafra which God the Supreme creator has chosen you to lead Biafrans to total freedom. You have given us a voice and looking at you makes us stand strong until we get back what the enemy stole from us one hundred years ago. You have got back the clothe Fredrick Lugard ripped off our fore fathers in the murderous name of amalgamation. Ever since we wore that fraud, disastrous identity, our lives had not been the same. The first thing you did was to dismantle the treacherous trick our enemies played on us by uniting us all. You came, showed us love, peace and kindness. I love you master. I have never seen a leader like you, Mazi Nnamdi Kanu since I was born. Each day I wake up from sleep I thank Chukwuokike for making me, a Biafran and also for choosing an honest and transparent leader like you to lead us out of this darkness into the land which the creator of the universe gave us, our inheritance and identity- BIAFRA. In no distant time, we shall march triumphantly into our blessed land. Like the biblical Joshua led the Israelis into the Promised Land, so shall you lead Biafrans into our land. 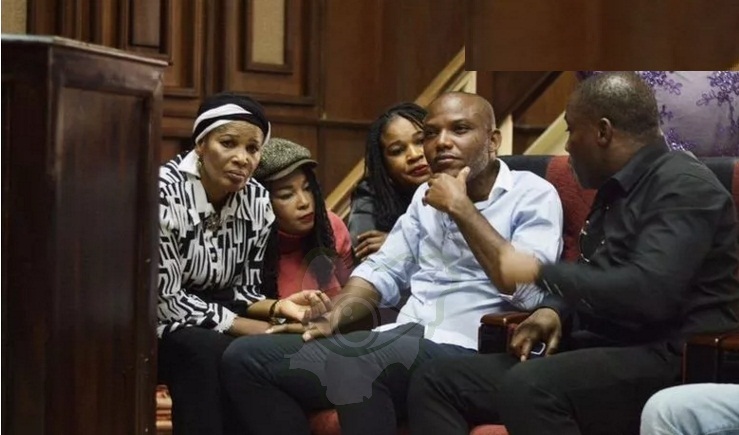 You, Nnamdi Kanu is the only leader I know on earth that still remained formidable even at the point of death. There is no greater love than this. Nigeria is neither a country nor a nation but a failed state created, owned and controlled by the British. We have been recycling in it, without any meaningful achievements. We carried Nigeria on our heads as if we were there when Lugard amalgamated the northern and southern protectorates, yet the enemies paid us back evil for good. They massacre us at any slightest provocation, implement murderous policies to hurt us yet we endured. Sir Nnamdi Kanu, our promise to you is that we will remain strong, resolute and formidable at the same time be fearless before our enemies until Biafra is fully restored. We stand shoulder to shoulder with you in this struggle. There is no going back. We are ready to sacrifice our lives so that our generation unborn can live in peace. We pray earnestly for your release. Biafrans from ENUGU, ANAMBRA, DELTA, BAYELSA, AKWA-IBOM, CROSS-RIVER, EBONYI, IMO, IGWUOCHA AND ABIA stand with you. We are ready to restore Biafra this time no matter what it takes, even our lives. We members of Family Writers will always fight for you. Be strong, the whole of Biafra is with you. Nwanne dalu,you have written the mind and support of millions of Biafrans.GOD BLESS NNAMDI KANU! GOD BLESS BIAFRA!! !